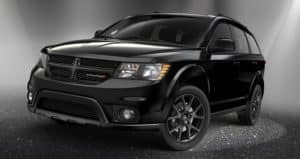 New 2018 Dodge Journey SUV for Sale in Washington, MI " "
If you are in the market for a more powerful family friendly vehicle with more space and added luxury than look no further than the 2018 Dodge Journey. With more than 200 available horsepower, luxury seating for up to seven passengers, added capability and safety features and even the latest in available technology this SUV/Minivan has it all and then some. 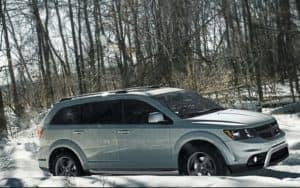 Available in four trim levels and two engine packages each all-new Dodge Journey model offers more power and capability to handle any adventure that you have in mind. Along with a 2.4-liter 16-valve four-cylinder engine, which is capable of 173 HP and 166 lb.-ft. of torque and offers up to 166 lb.-ft. of torque as well as a highway driving range of over 500 miles on one tank of gas, this all-new SUV is also available with an authoritative 3.6-liter V6 engine, which is rated at up to 283 HP and 260 lb.-ft. of torque and offers more exceptional performance than ever before. Along with being paired with either a four or six-speed transmission, the available All-Wheel drive system that is available on each trim level also makes taking adventures on ice, gravel, or any other rough surfaces safely more possible. For those who opt for the ultra-capable 3.6-liter Pentastar V6 engine, will also have the capability to tow up to 2,500 lbs. So, if you need an SUV that can tow your bass boat, a set of jet skis or just need to take some heavy furniture across town, you now have more capability than ever before. Along with power, the 2018 Dodge Journey for sale in Washington, MI also offers more space than any other model. With luxurious seating for up to seven passengers of all sizes in the large cloth or heated leather seats as well as available integrated second-row child booster seats that can be conveniently folded away when they are not needed you can rest assured that every family member or friend can come along for a ride. Even a large and in charge third-row seat, which is available on all four trim levels, is accessible from anywhere within the inside of the Journey. Anyone with a large family, is sure to need a fair amount of storage space as well. This spacious Dodge SUV even offers up to 67 cubic feet of cargo space as well as in-floor storage and even a second-row storage bin that doubles as a built-in cooler. Every person, pet and plaything you bring into your Dodge Journey is as important to us as it is to you. That is why this vehicle is packed with advanced safety technology to help protect all passengers. Along with a ParkView Rear Back Up Camera, the 2018 Dodge Journey is also loaded down with seven advanced airbags, active front seat head restraints that move during a rear-end collision to decrease the space between the headrest and head to help reduce the risk of head, neck or spine injuries. Specially designed front and rear crumple zones even help absorb impact energy and redirect it away from passengers to reduce the risk of injury. The Electronic Stability Control with Electronic Roll Mitigation system also makes driving safer no matter what road you travel on by monitoring your steering input and vehicle motion to help you maintain directional control. This system even applies the brakes and reduces engine power to help prevent wheel lift and the possibility of a rollover. If you and your family are in the market for a vehicle that can do it all in complete comfort and safety than get to Orchard Chrysler Dodge Jeep Ram today to slide behind the wheel of the 2018 Dodge Journey. This will be a ride that you are not soon to forget!